Whether you've been a VR diehard for years, just picked up one of the lovely bundles from our list of the best PlayStation VR deals, or you're still on the fence, this discount on PlayStation VR's new best game should have all of your attention. 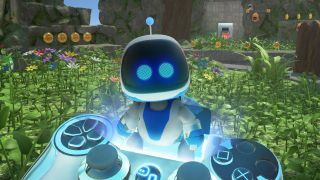 Download codes for Astro Bot Rescue Mission, Sony's endlessly clever VR-exclusive platformer, are available now for $19.99 (save $20) at Walmart as one of the low-key greatest Cyber Monday game deals out there. PlayStation VR's best game is still quite new, but you can already get it in download code form for half off at Walmart. Prepare for virtual reality platforming nirvana! PlayStation VR first came out in 2016 and it's hosted plenty of good games since, but it's arguably been missing that one killer exclusive; the kind of thing that sells you not just on the game but on the entire system. That changed in October with the arrival of Astro Bot Rescue Mission. Think I'm being hyperbolic? Take a scroll down the Metacritic listing for the game and see how many times phrases like "best PlayStation VR" game come up. Spoiler: it's a lot. Ok, so it's good, but what is it? Astro Bot Rescue Mission's a 3D platformer, which means it plays similarly to Mario games (especially Super Mario 3D World). On top of running and jumping, Astro Bot uses your semi-physical existence in the world to novel effect: you might have to bop obstacles with your head, crane around to spot hidden passages, or use your floating controller as a motion-tracking multitool. It all works together with the joyfully colorful visuals and chipper soundtrack to create a fantastic, energizing experience. Try it!